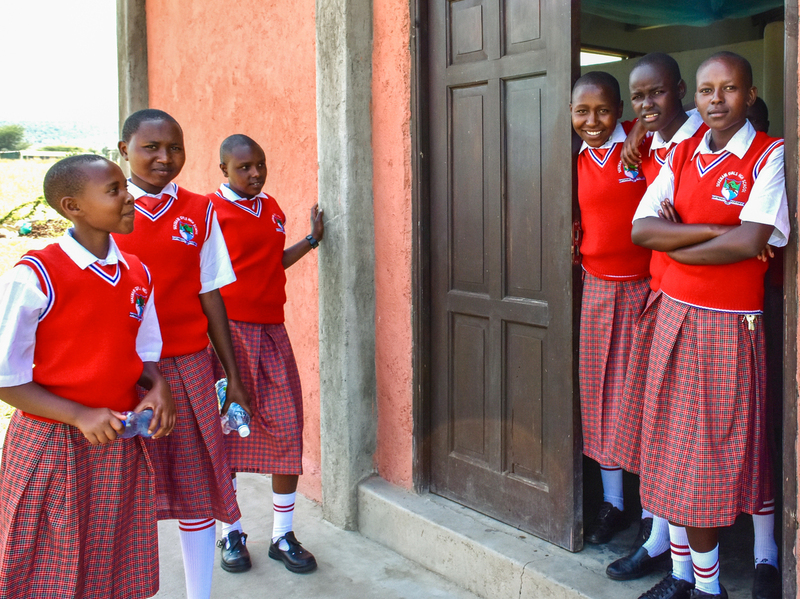 New Boarding School Is A Game Changer For Maasai Girls : Goats and Soda Many girls in Maasai culture drop out at 12 and end up caring for cattle or cooking at home. Many are subjected to female genital mutilation. The new Sekenani Girls School is a game changer. Students from the Sekenani Girls Secondary School gather outside their dormitory after lunch. 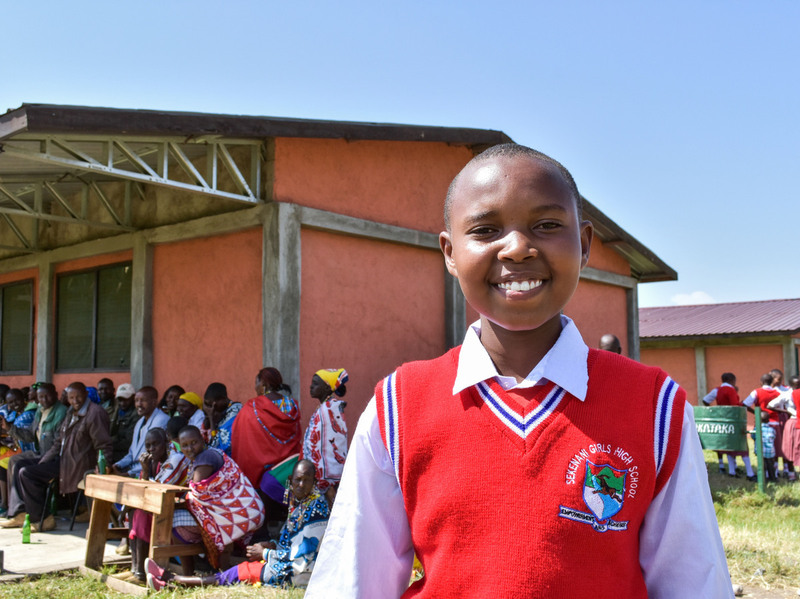 The new school is the first high school for girls in the Maasai region. "I need my freedom, I want my rights, the right to education, the right to choose and the right to grow into the woman I want to be." Welcome to the Sekenani Girls Secondary School, located in Kenya's Maasai Mara, a world famous game reserve known for its rolling grasslands, giraffes and safari jeeps. But not for schools. Sekenani Girls, with 68 students, is a boarding school that had its official opening this year. It's the only secondary school for girls in the region, so there is huge demand. The next closest options are in Narok, nearly 56 miles away — a 3-hour drive on dirt roads. So instead of dropping out of school at around age 12 – the typical age that a girl stops her education in the Maasai culture – these girls can keep studying. Faye, 14, a pupil at the school, proudly shows visitors the classrooms and grounds. "Although all children in the Maasai Mara could benefit from better access to affordable education, girls are particularly vulnerable and marginalized," says Sonal Kadchha, founder of the Sekenani Girls Secondary School and the charity Educate the Children (ETC), that helps fund it. Funding is through a public-private partnership — Kadchha's ETC charity covered the costs of the school build, the government helps subsidize student fees and the families pay the remainder. The cost is about $295 per student per year; the government covers approximately $84. All students receive a traditional Kenyan education to ensure they can enter the national work pool or go on for higher education. Subjects include English, mathematics, science, history and geography; clubs are devoted to sports, art and dance. The goal over the next five years is to expand the school to educate 500 girls. And the impact that will have is huge. Without the possibility of further schooling, girls care for cattle or stay at home and cook for the family. Many are subjected to female genital mutilation (FGM) which, although illegal in Kenya, is still a common method of marking a transition from childhood to womanhood. According to a 2013 UNICEF report, 27 percent of women in Kenya have suffered FGM, with the majority of those coming from rural areas like the Maasai Mara. The age at which girls are cut varies, but the report says that for most girls in Kenya, it's between 9 and 16. "Girls that we spoke to regarded their place in boarding school as a protection against FGM and their only means of expressing their choice in the matter," Kadchha says. Change needs to come fast. Although there are ample job opportunities in the Maasai Mara (a haven for tourists with more than 100 tented camps and lodges), an ETC study shows that only 2 percent of people employed there are women. In addition, with the government's constitution stating that only those possessing a secondary school certificate are eligible to apply for any kind of formal employment, the future has looked fairly bleak for the Maasai's girls. This prospect was one that Kadchha couldn't accept. A finance professional living in London, she went on a fundraising trip to Kenya for a primary school and was struck by the lack of opportunity for the local girls. "I come from a traditional Indian family and would have had an arranged marriage if it was not for my education," she says. "I studied hard in school, impressed my father and got excellent grades so he let me go to university and have a career." She returned home and set about raising money for a secondary school for girls. She persuaded friends and family to run marathons, enter charity bike rides and host fundraising events while also securing corporate donations of more than $14,400. The process took five years from fundraising to securing the site, building the school and finally opening the doors to students. At the official opening ceremony, on a Saturday afternoon, members of the community squeeze into a large tent to shade themselves from the intense equatorial sun. "Oh, I like school very much!" says Mercy Lemiso, 16, whose family lives 19 miles away in Talek. A family friend told her about the school. "I board here for three months at a time and, although I miss my family, I am lucky to be getting a good education. I want to be a doctor and if I work hard I can get a loan from the government for university." Her school friends are keen to talk about their experiences. "When I grow up, I want to be an engineer," says Marion Samuel, 14, who comes from Mararianda, about 56 miles away. Marion learned about the school through teachers at her primary school. "I want to make electricity," she says. "That way, I can help my parents get power in their village." Another student, 14-year-old Faye Tikani, who lives in the town of Nkoilale just 6 miles up the road, chimes in, "I want to be a lawyer." The girls proudly point out paintings they drew to decorate their dormitory. While lack of access to education for women in the region remains a pressing issue, there is a strong feeling of celebration and hope at the launch of the school. Throughout the afternoon, the schoolgirls' chanting rings through the air: "I need my freedom..."